First off, thanks to all of you who responded to my question in the May issue: Should the e-Newsletter continue? I was glad to hear that you enjoy the newsletter and would like to see it go on. So, continue it will. But – this summer is going to be busy with travel and legacy video production, leaving little time for newsletter writing. So for the next few months, we’ll present some articles from years ago. Think of ’em as summer reruns! Tick, tick, tick… Ah, the last half-day of school before summer recess. Tick… Books handed in, report card in hand. Tick… Nothing left to do but fidget at my now empty desk, watching the second hand of the classroom clock count down the final minute. Tick… And then – the final bell! Bursting through the school exit, giddy with freedom, the blank slate of summer stretching out before me, just waiting for me to etch my vacation story! My summers as a kid during the 1960s brought hours of play, a trip to the lake, and – summer reruns. The Man from U.N.C.L.E, The Fugitive, The Wild Wild West, Lost in Space, Star Trek, Mannix – the list goes on and on. TV shows that aired on school nights – and that were either broadcast after my bedtime or that homework kept me from watching – now I could see them all! Yep, in the pre-VHS, pre-TiVo, pre-cable and pre-streaming world in which I grew up, you usually had two shots at catching episodes of your favorite programs – once when they aired during the regular season, and again when they were repeated during the summer. For the next few months, the Family Legacy Video® Producer’s e-Newsletter will be offering its own selections of reruns – articles from years past that you may not have caught the first time around. 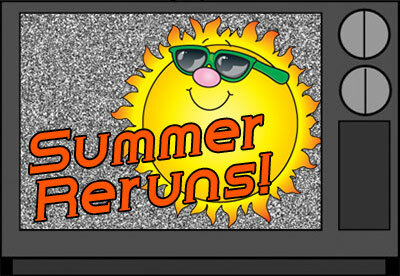 So, have a great summer – and enjoy the reruns! Most humans are visual thinkers. Our thoughts are composed of imagery and pictures. And the right combination of images and sound coming from a TV or movie screen can inspire a wide range of emotions that leave indelible memories behind. In addition to emotional impact, photos, family films and other memorabilia like newspaper clippings, trophies and medals lend your documentary what video pros call “production value.” In short, interesting and well-placed visuals make your video more fun to watch. And you DO want your family to watch. This is just as true for your family history video as for any Hollywood film. That’s why, after a Family Legacy Video® client lets me know what he or she wants to talk about during an interview, I always ask what visuals are available. It’s certainly great to have that interview with grandma and to be able to watch her tell stories about growing up on the family farm. Couple those stories with photos of her riding the old tractor or milking Bessie, mix in music that evokes the country life, and you add visual and emotional components that serve her story and make it even more memorable. As you plan your interview, make a list of all the visuals you’d like to have in the video. Ask your interview subject what he or she can provide. Reach out to any other family members who may have resources. Collect those visuals and keep them safe. Don’t have anyone mail you one-of-a-kind photos. Have copies made for mailing or, if possible, go to where the photos are and shoot or scan them there. After the interview is over, you’re likely to find there are additional visuals you’d like. Remember to be as creative as possible and not to let a lack of family photos get you down. If you don’t have a picture of the farm, ask the tourist board for the state where your grandma’s farm was located to send you a picture of the countryside. Or find a vintage map showing the farm location, or a modern map that you can shoot and turn black and white or sepia using your editing software. Then, as the music plays, you can pan across the photo or map to set up the story about life on the farm. The possibilities are endless – and fun. May 2005: A sound idea for your next family history video. Have you ever thought about what an important role sound plays in our lives? For those of us fortunate enough to be able to hear, sound is a vital part of our existence, one we often take for granted. As I type these words, I hear a myriad of sounds around me: the tappity-tap of my keyboard keys; the whir of the fan in my computer; the distant cry of a quail; the chirps and twitters of a variety of other birds; the far-off rumble of a passenger jet. Sound truly adds richness and depth to our daily sensory experience, and, when used creatively, sound can also enhance your family history video. You can use sound effects in a variety of ways. Thunderous explosions accompanying photos of the attack on Pearl Harbor can introduce a segment on World War II in a very dramatic fashion. The throaty bellow of an ocean liner can add some life to a shot of the ship your grandparents took on their honeymoon cruise. The sputter and backfire of an antique auto can lend humor to that picture of your great-grandfather posing with his prized Model T.
Companies specializing in creating sound effects have been around for years. And while you can buy sound effects collections, there are some perfectly good low- and no-cost options available. If you have access to the Internet, open your browser and search for “free sound effects.” You’ll find a number of sites offering sound effects you can download for free. If you don’t find what you’re looking for online, see what your local library has to offer. It may have sound effects included in its audio collection. As you plan your family legacy video, don’t forget to consider sound effects. They can bring an added dimension to your video biography viewing experience.